"Love you & miss you"
On, Wednesday, August 29th, surrounded by her family and close friend Linda Hume, Vickie Karns at last won her battle with ALS at age 71 and is off to greener pastures and Still-waters. A memorial service will be held at 4:00pm Tuesday, September 4, 2018, at the First United Methodist Church in Stillwater. Strode Funeral Home is in charge of the arrangements. She was born on December 10, 1946, to John and Jewel Williams in Denver, Colorado. Her sister, Jeannie, joined the family 18 months later, and the two became best friends for life. 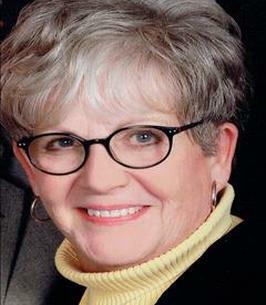 Vickie graduated from Littleton High School in 1965 and attended Cottey College in Nevada, Missouri. She then attended Oklahoma State University. She left OSU to be a flight attendant for United Airlines and then returned to Oklahoma to marry Lee Nickels and build a family and business. After becoming a single mom, she focused on her children and her education while returning to the corporate world, first as a real estate agent and then at Stillwater Savings and Loan. She graduated from OSU in 1997, receiving her diploma on the same day as her middle child, which landed them on the front page of the newspaper! After graduation, Vickie joined OSU Spears School of Business Center for Executive Development. In all her work, she found great joy in serving people, whether it was selling homes, helping bank customers or students, or matching the right faculty member with a business to meet their training needs. She was active in the community and her church. She worked several United Way financial campaigns. She was an active member of the First Presbyterian Church and later First United Methodist Church, where she was a founding member of a singles program. She helped lead several Divorce Adjustment Workshops. She developed a deep love for dancing and she and Monty Karns would frequently grab one another and begin dancing if they heard a song they loved. Later, at FUMC, she found two deep callings: a commitment to help families with financial planning: and a commitment to help foster families by providing clothes, furniture, toys, and other necessities through Hope House. Through all of these endeavors, she formed many long, enduring friendships that she cherished. True love entered Vickie's life with her union on August 26, 1995, to Monty Karns. They enjoyed many adventures and lots of laughter during their years together. Before accepting his offer to go steady, she made it clear that Tuesday and Friday lunches were reserved for her dear friends Ann Houston and Alice Fowler, both of whom were of great comfort in her final months. Monty was a dedicated, comforting force during Vickie's battle with ALS. Vickie is survived by her husband, Monty, of the home; sister, Jeannie Snider of Littleton, Colorado , and her husband, Edward; son, Todd Nickels of Edmond, his wife, Jamie, and their children, Jack and Gabby; daughter, Krista Sampson of Grove, her husband, Jack, and their sons, Mack, Coy, and Cy; daughter, Kerry Holderread of Cushing and her children, Kade and Kennedy; mother-in-law, Nelma Karns of Stillwater; stepson, Daniel Karns of Toledo, his wife, Heather, and their children, Miller, Asa, and Grace; stepson, Allen Karns of Nashville, his wife, Janet, and their son, Wendell; step-daughter, Kara Miller-Karns of Leawood, Kansas, her husband, Mike, and their daughters, McKenna and Kailyn; cousins, Skip and Patty Buechner, Kathy and Mike Peterson, Megara Kastner, Jerry and Sherry Bragg; a host of extended family and dear friends. The family is particularly grateful to the many wonderful caregivers and Judith Karmen Legacy Hospice for the care they gave Vickie in her final months. To know Vickie was truly to love her. A kinder, more giving, and funnier soul would be hard to find. Her smile will be missed by many. In lieu of flowers, Vickie asks for donations to Hope House, a mission that meant so much to her, through the First United Methodist Church Stillwater Foundation, Hope House Endowment. Vickie was adamant there would be no black worn to the service, unless it is trimming the World’s Brightest Orange! To send flowers to the family of Vickie Lee Karns, please visit our Heartfelt Sympathies Store. We encourage you to share any memorable photos or stories about Vickie. All tributes placed on and purchased through this memorial website will remain on in perpetuity for future generations. The death of a loved one is the most devastating experience a family can face. At times, the loss will seem unbearable. Please know that there are friends who care about you and your family during this difficult time and more importantly Psalm 34:18 tells us that "God is near to those that are broken at heart. We pray that Jehovah the God of all comfort is with your family during this difficult time of grief. Our prayers are with you and your family. I am saddened to hear of Vickie's passing. She was a kind and generous lady and I was privileged to have known her. My thoughts and prayers are with her family. Lynda Reynolds, former Stillwater Public Library Director.